This is my easy take on Hungarian goulash, based on the one my Aunt used to make. It is easy to prepare, delicious and it will easily feed six people. 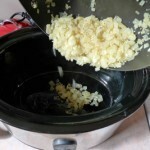 This meal can be prepared in a slow cooker in the morning before work so it will be ready when you get home from work, you just need to make the rice. Dice onions and capsicums. Chop the meat into 1-inch cubes. Fry onions and Garlic in a tablespoon of butter or a little oil until the onions are nearly clear, add to a large heavy based pot or slow cooker. 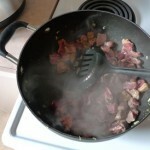 Fry off the outside of the meat quickly over a high heat in batches so that it does not stew or overcook. 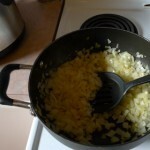 If you have a big enough frying pan you can fry the meat with the onions. Just brown the outside of the cubes of meat, do not cook the meat through. 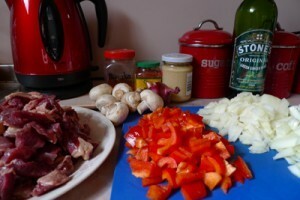 If using a slow cooker, roll the cubes of meat in plain flour before frying, then the sauce will thicken while it cooks. Add all ingredients to a deep, heavy-based pot add a few grinds of black pepper then cover and simmer on low for about 3 or 4 hours (more if desired) or until the capsicum is cooked through. 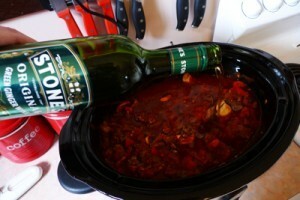 The longer the goulash simmers the more tender the meat will be. 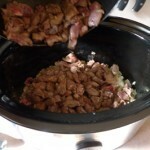 Or add all ingredients to a crockpot and leave to cook on low all day. 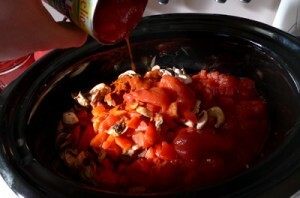 If the sauce is too thin or there is too much liquid, uncover and simmer on high until the liquid has reduced a bit. Taste the sauce and add a few pinches of salt, if needed. At this point, you can add another splash of stones green ginger wine to enrich the ginger flavour. Serve over piping hot garlic butter rice. Will keep in the fridge well for a couple of days, also freezes well. This is a slightly different approach to rice. Add butter, garlic, and salt on top, this will look a bit wrong but they will cook through. Bring to a boil uncovered, drop the heat to a low simmer for about 12 minutes or until the rice is nearly cooked. Gently stir the rice every 4 or five minutes to stop it sticking to the bottom of the pot. Add a little more water if the mix dries out too much. Stir just enough to stop the rice sticking, no more, or the rice will become gluggy. When nearly done, the rice should have a consistency similar to risotto. Remove from the heat cover and leave to stand for 8 minutes. The remaining liquid will absorb leaving the rice perfectly cooked and delicious.